As I’ve mentioned before, I’ve never been a huge fan of doughnuts. 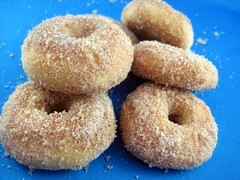 Growing up, we ate bagels or cereal for breakfast, and doughnuts were thought of as a dessert. When I went away to college, doughnuts were available everywhere, and when I entered the working world, I noticed they were a regular early morning treat. I still never got into them, mainly because of the greasy feeling in my mouth and the heavy blah I would feel in my stomach after eating them. So when I had a random craving for doughnuts (I blame the Food Network), I Googled recipes for baked doughnuts and figured I’d give them a shot. Since I was trapped in my neighborhood this morning thanks to the LA Marathon, and the weather had finally cooled down enough to even think about turning on my oven, it seemed like the perfect day. I halved the recipe, because I was afraid I would either a) not like them or b) like them, and didn’t want to have too many, either way. The process was fairly easy although time consuming, as are most yeast breads. The dough came together really nicely using the dough hook, and was easy to work with as well. Since I don’t have a doughnut cutter (oddly, there is such a thing), I used a 2-inch biscuit cutter, and the bottom of a pastry bag tip to cut out the inner circle. You can improvise–before I finally got around to buying a biscuit cutter, I used a drinking glass. Just look around your kitchen, you’ll find circular things. Because I’m used to fried doughnuts, I was expecting these to be heavy, but was happily surprised to discover they were light and airy. The dips in butter and cinnamon-sugar finished the doughnuts off perfectly, and I can definitely see myself bringing these to a friend’s house–for brunch or dessert. And don’t forget about the bonus doughnut holes. Enjoy! Place 1/3 cup of the warm milk in the bowl of an electric mixer. Stir in the yeast and set aside for five minutes. Be sure your milk isn’t too hot or it will kill the yeast. Stir the butter and sugar into the remaining cup of warm milk and add it to the yeast mixture. With a fork, stir in the eggs, flour, nutmeg, and salt – just until the flour is incorporated. With the dough hook attachment of your mixer beat the dough for a few minutes at medium speed. If your dough is overly sticky, add flour a few tablespoons at a time. If it’s too dry, add more milk a bit at a time. You want the dough to pull away from the sides of the mixing bowl and eventually become supple and smooth. Turn it out onto a floured counter-top, knead a few times (the dough should be barely sticky), and shape into a ball. Transfer the dough to a buttered (or oiled) bowl, cover, put in a warm place, and let rise for an hour or until the dough has roughly doubled in size. Punch down the dough and roll it out 1/2-inch thick on your floured countertop. If you don’t have a doughnut cutter, use a 2-3 inch cookie cutter to stamp out circles. Transfer the circles to a parchment-lined baking sheet and stamp out the smaller inner circles using a smaller cutter. If you cut the inner holes out any earlier, they become distorted when you attempt to move them. Cover with a clean cloth and let rise for another 45 minutes. Bake in a 375 degree oven until the bottoms are just golden, 8 to 10 minutes–start checking around 8. While the doughnuts are baking, place the butter in a medium bowl. Place the sugar and cinnamon in a separate bowl. Remove the doughnuts from the oven and let cool for just a minute or two. Dip each one in the melted butter and toss in the sugar bowl. These even LOOK light and airy. I’m gonna have to try these! ooh, yummy. they LOOK fried! I didn’t grow up eating donuts either, other than as an occasional treat and even then they never did much for me. The only donuts that have ever bowled me over were from the Donut Plant in NYC. Those donuts are epic. That being said, I like the idea of a baked donut as a treat and I think I might try these. I eat a single donut a week from a place around the corner (oh, Donut King, you have the tastiest lemon stick! ), but I could see this recipe being fairly adaptable with different flavors. Now I have ideas! Awesome baked doughnuts! I hate that greasy feeling you get after eating too many fried doughnuts 😉 thanks for posting! Wow looks so yummy. I love it. You are inspiring me! I’ve always wanted to try making donuts. I was always too intimidated. Chocolate cake donuts with chocolate glaze and sprinkles are one of my favorite foods on earth! Wow! Those sound delicious! I’ve always wondered if you could bake them…duh! I hope to try them out this weekend. Wow, these look completely wonderful. I love it that you baked them because I have a fear of deep frying ;). I am putting this into my bookmarks. These look yummy! I love doughnuts and these actually sound easy enough to try. Thanks for sharing this. I recently launched my own blog, I’d love for you to check it out and let me know what you think! 🙂 Thanks! I just made a batch of baked doughnuts too! Instead of using yeast, they were baked in mini bundt pan (filled only about half way with batter to create that doughnut shape). They tasted great, but weren’t really as doughnut-y as I had hoped. 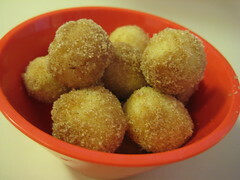 It looks like this recipe really nailed it though, I’ll use it for my next doughnut adventure. Thanks for the great post!